Have you ever been to a garage sale and seen someone trying to sell a giant granny bag of rumpled, once-used gift bows? Probably not. Because I bought them before you got there. Dude. Don’t hate me because I’m early. I made this red one last year but never posted it. I liked it so much I made a silver and blue one to match. The only hard part is collecting the bows. I keep a bow drawer so I’m always stocked, but if you need some cheap, I suggest you check the dollar store. 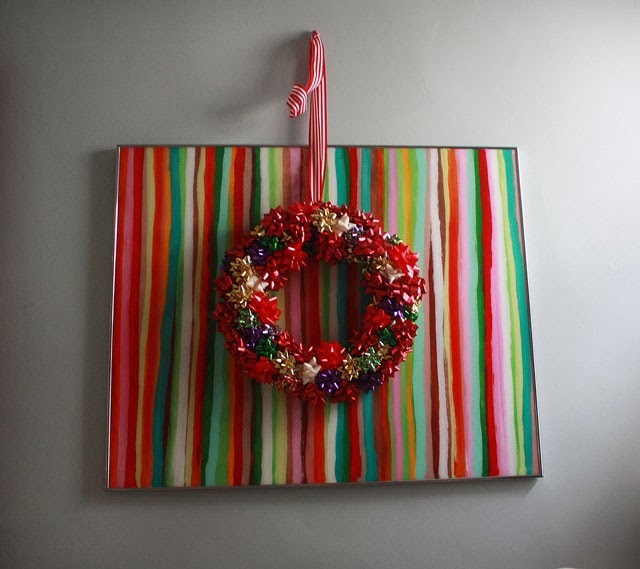 Or just save up bows as you cross them this year and save this project for next year. These could not be easier to make. When I say ten minutes, that means ten minutes. 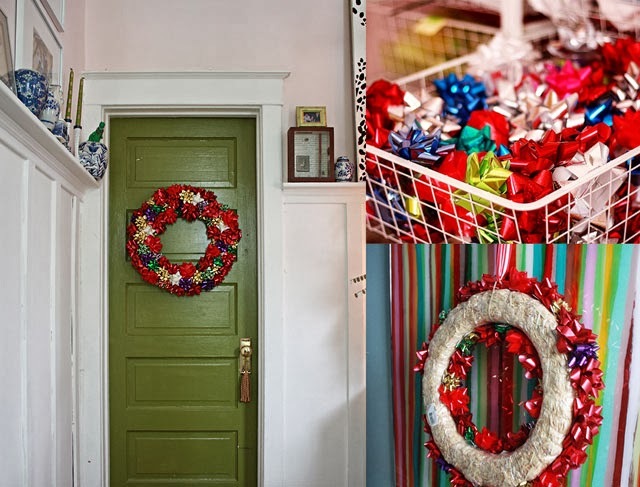 All you need is a wreath form, dress pins and bows. 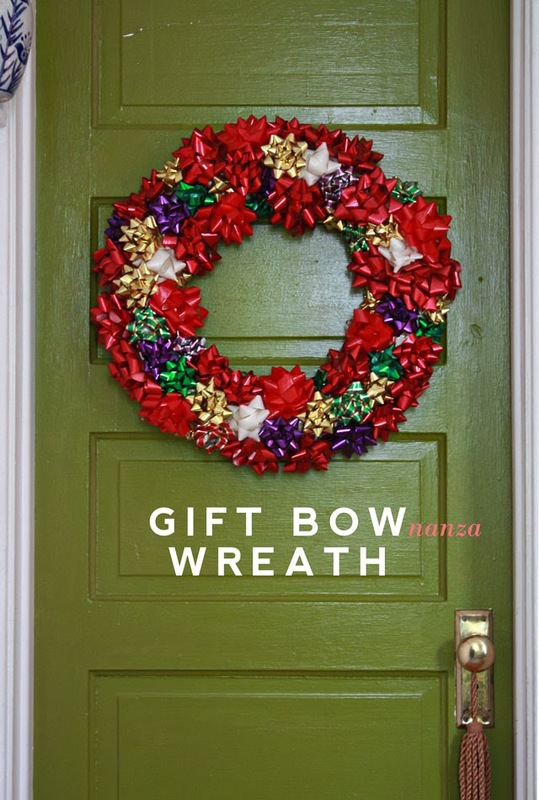 Use the bow adhesive to stick to the wreath form then reinforce with a dress pin. Boom. That’s it. You could use hot glue too, but don’t expect it to last more than a year or two, especially when exposed to the elements. A Straw wreath form will hold pins better. I can usually find one or two for a buck at Goodwill. Pearl head pins hurt less then no-head pins. You could also use a staple gun or greening pins. Your call. Not enough gift bows? Fill in with tuffets of curly ribbon. Oooh, loving the blue and green one! May have to save this idea to do with the boys next year…. Darn. I knew I should have been hoarding all the gift bows from past Christmas gatherings. Very cute! Oooh, I can’t wait to try this. I’m a sucker for post-holiday 90% off sales and I have a LOT of bows. I’m also searching for a project that will use many rolls of wrapping paper! Peaches and Linda, you can make handmade paper beads with some of the wrapping paper. 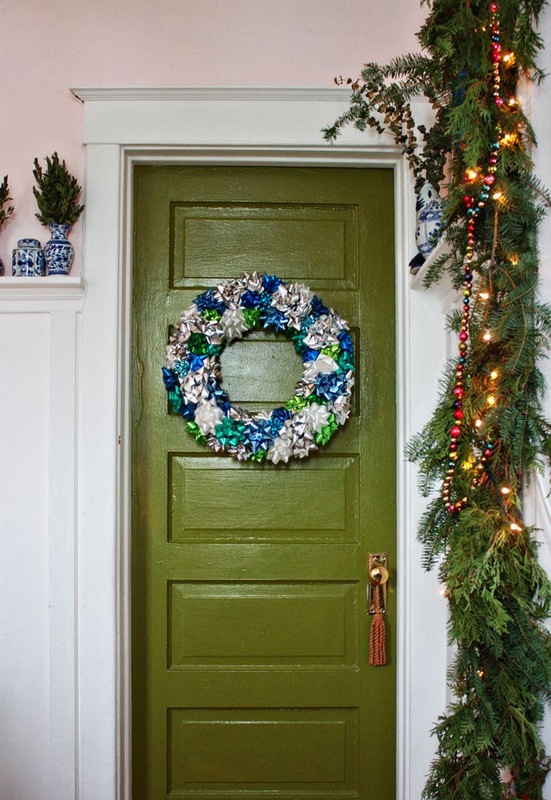 How about a wrapping paper wreath? Also I like to make ornaments covered with wrapping paper/sheet music paper. Hope some of these ideas help!